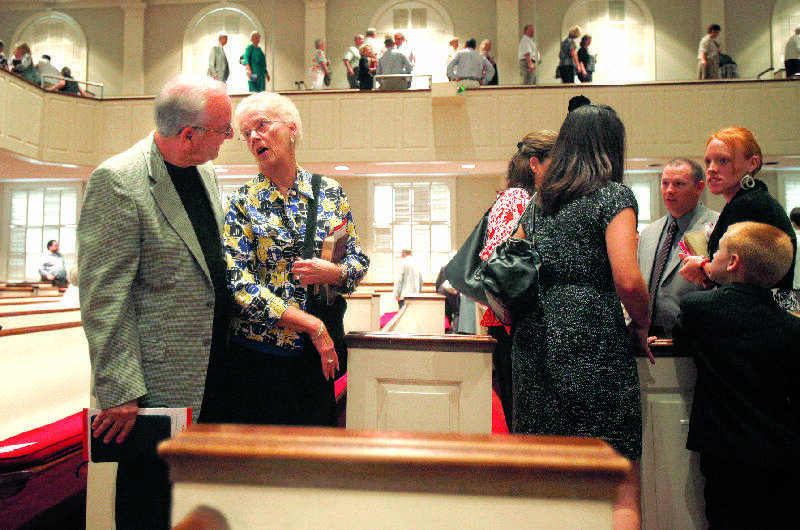 Matt and Frances Nevels talk after services at Red Bank Baptist Church. It was their first time visiting the church in almost 20 years. Below are letters emailed to the Times Free Press in response to reporter Joan Garrett's June 24 story "Tempest in My Soul." The story dealt with a Southern Baptist minister's struggle with his faith when he found out his son was gay and dying of AIDS. Usually, I just browse though the headlines during my second cup of coffee and go on about my day. Your story was an exception. I read it first to last word. I'm neither Baptist nor gay, but my takeaway from reading your article (outside of the circumstances of the family you followed) is we all have the right to formulate our own beliefs, but in the process, should respect the beliefs of others ... While everyday "run of the mill news" still has a place, your type of story and the manner in which you present it stimulates thought and meaning, making it an exception to the "average" news story. Thank you for your journalism. I still have tears in my eyes after reading your incredible article. Truly written from the heart. It is time for change and for the hypocrisy to stop. God bless the Nevels family. Now is when I believe their true calling has come. Just finished your article in this morning's paper and was mesmerized by the story-telling style as much as the controversial content ... I am proud of the Times Free Press for presenting this topic in this particular way in this market. Thank you for your excellent and very-moving piece published in Sunday's CTFP. Your text is imbued with hesed -- the Hebrew word for kindness and compassion. This story has touched me to my core ... I struggle with this issue all the time and ... I have no one in my family closely affected by this. It is just something that has gnawed at me for years. My heart goes out to the Nevels. I hope they have found peace and pray when they get to heaven their son will be there waiting for them with open arms. How beautifully and perfectly it captures the conflict of weighing lifelong traditions and beliefs against the pain and love for your hurting child. I appreciate the honesty Mr. Nevels displayed, and the unashamed love he has for his son. Thank you for this lovely, emotional piece that hit so close to home for me! You state that the article is not intended to advocate either side. If either of you is a good journalist, then you realize that the article does its best to create and leave the impression with readers that Red Bank Baptist Church, the Southern Baptist Convention, and anyone who believes that the entire Bible is the Word of God is a hard-hearted, cruel and vindictive person. The article is written like the writer was there at each step, so obviously almost all of the talking points were derived from the family sources, which inherently make it one sided, which it is. You talk about giving a perspective -- which is what? -- A reader in Calhoun, Tenn. It was immediately clear to me how much time, research, and effort must have gone into the writing of this feature article. As a person who considers himself strongly against organized religion, indeed, against any belief in the divine at all, naturally it was easy for me to see most of my feelings about that aspect of our society confirmed. But, as a lifelong academic, I was also struck by what I considered your balanced and fair presentation of this terribly sad story. Consequently I would like to offer my congratulations for an excellent contribution to our community's learning to understand that little in life is clearly black or white. I read your article about "AIDs in the Pews," which is really about families, churches and the challenge of homosexuality in the church. It was a most beautiful, painful and beautifully told story. It told the difficult truth about the impasse where we find ourselves. I want to share it with others. By the way, I am a Baptist minister. A reader in Birmingham, Ala.
but I found your Sunday article to be highly informative and beautifully written. It was one of the most moving stories I have read in my 25 years of picking up the Times Free Press. Their story traces perfectly an uneven transition of attitudes toward homosexuality, the sort of important story, as Gene Roberts used to say, that oozes instead of breaks. I am glad you went along with Mr. and Mrs. Nevels back to Red Bank Baptist, so we could all go along with you. Objective and fair to both sides of the dispute. Compelling in many respects. Thanks for making my Sunday morning even brighter than it already was. I think it was very objective and so poignant. It brought tears to my eyes. Personally, I don't know what is right on this issue, and that's my position. I hope and believe that your article will cause people to think about it and not be so rigid. Whether homosexuality is sin or not is not for me to say and God forgive me if I judge an individual. I want to thank you for a beautifully written article regarding homosexuality and the church. As both a pastor and someone who worked in news for 19 years before going into ministry, I have a deep appreciation for your skillful and touching piece. You did a masterful job of combining the personal aspects and the doctrinal challenges in the Christian church. Your article is more powerful than any sermon I could ever preach. I'm left feeling like Dr. Steelman, who purportedly is NOT the subject of the story, is nonetheless the subject of the story. I don't know him, have never been, am not, and almost assuredly will never be a member of RB Baptist nor any other Baptist church, so speak from no loyalty to him or his denomination, yet am more than a little puzzled that he figures so prominently as the heavy in this scenario. Plainly, the Nevels left the church, the church didn't leave them. Grim though it is, the sad fact is that most of us are caught up in the vagaries of everyday life, and it is by virtue of the fact that we are consumed with attending to private griefs and tragedies of our own that we fail to expend time and attention on others, particularly when those others have positioned themselves in less accessible places like the Nevels did. I just want to thank you for your boldness in telling a story like this one here in East Tennessee, where such stories are not always well received. ... Your article was thorough, colorful, touching, objective, and beautifully written. I want to thank you for this lovely, lovely story. Mr. and Mrs. Nevels are an inspiration, and I am awed by their strength and courage -- the way they came to terms with their son's identity, stood by him in the face of condemnation, and after his death, reached out to help others in similar circumstances. It's wonderful that they have been able to return to their church and resume their place in that congregation. And hooray for Dr. Steelman for extending his hand in friendship, after all that has happened. ... You have made a tremendous contribution to our community. Your story will be read by many, many people and will help us all to move forward. I'm glad to see that a member of the press reported on a story and gave a well-rounded look at the opinions and beliefs of all of the people involved. Much too often the author gives a one-sided view of a story, and it's usually their own side. My opinion on homosexuality rides the fence, as I am not gay. Your article was just refreshing to read. Thank you for writing such a moving, sensitive article. I hope that it opens many hearts and brings more understanding to what so many families face. I am retired and long married (to a) 67-year-old man and experienced every imaginable emotion reading your article. The overriding emotion was sadness, then joy. Outstanding. I cannot tell you how speechless I was when I read this article. I recently came out to my parents before I moved back to Chattanooga. I was riding to church this morning with my mother and I started crying as I read this article. I told my mother what it was about. Hopefully, she and my father will get around to reading this article tonight. I cannot tell you how true this article is. I found myself running from God, mainly because people used His name to hate me. Without any visible bias, you made clear the ordeal and the spiritual journey of these people. And you compelled me to read all the way to the end, when frankly I was often tempted to fling the newspaper across the room in exasperation. Chattanooga is my adopted home, and I love it, but this story made me feel ashamed of it. Failure of compassion is human, but such sustained and determined failure of compassion is hard to understand. That church should be humbled and grateful for the Nevelses' forgiving spirit. For the first time in my 50ish years I have to take the time to thank (a story's) writer and to offer praises for the quality of writing. I was so relieved to see that the article did not encourage me to feel one way or the other about this issue, but feel I did. In fact I read it through eyes blurred by tears. Your reporting was so moving, such careful journalism ... how you got all that information in without showing a bias!!! Your revelations of the very personal challenges that many families face in dealing with these types of issues were thoughtful and presented on very human level. You did not sensationalize or blatantly editorialize as is the case too often in some reporting. ... Offering all sides that balance not only reflects well on you as a professional, but offers an example of the thought-provoking questions that everyone should consider when determining their personal approach to these types of issues. I've never written to a newspaper nor specifically to someone who has written an article which was published. Writing now is a tribute to just how deeply I was moved by what you had written. ... But I've been a Christian for many years, and I'm aware personally of how a church you've known and loved can very quickly turn from you. I normally just read the sports section and give a quick glance to the other stories. I read your story about Matt and Stephen Nevels. It was absoutely the best article I have read in 20 years. It was balanced. You could feel the love Matt Nevels had for his son, Stephen and also his church. I could picture how torn he was and is. Tears ran down my face. Thanks so much for writing the story. I just wanted you to know that the sensitivity and identification with the heart of two parents who lost their son and their church, is phenomenal. Thank you. I am so surprised that you would write such an article. It was disgusting. First of all, why would parents let their dead son be dug up in people's minds after so many years? Why not let him rest in peace? I am thankful that Dr. Steelman stood up for what God says in his word, but if I was him I would be very upset at this article. I think if I was the pastor now I would make my stand. Does he think this lifestyle is OK? If so, God forbid at what our world is coming to. This article has done more damage to the work of God and the church than anything I know in recent months. If Mr. Nevels thinks he can change what God said in his word he is wrong. Sin is sin. Yes, God loves people who live this lifestyle but hates their sin and is willing to accept their repentance. Sin is a choice, no matter how you look at it. Ms. Garrett has done them and our city a great service by presenting the facts in such a compassionate and dispassionate way (not an easy trick to pull off, but I think she succeeded.) It's such journalism that prevents me from canceling my subscription to your paper. I don't know if I have ever read a more compassionate and reconciling story in the newspaper. In these days of declining print media you have provided quality journalism for us all. Thank you. Your ability to weave the human stories of parents, family, faith, community, preacher and church without finger pointing and blame makes this story all the more rich and complex. I read the story aloud to my wife, and my eyes filled with tears on more than one occasion. The story is moving and powerful. Our son, who lives in Texas, emailed me saying, "you have got to read the piece in the Times Free Press." I already had and I am glad I did. I found myself neglecting my breakfast Sunday morning after I started reading your superb article on the family that lost their son to AIDS. I thought it was also an absorbing account of how attitudes, including religious beliefs, that seem locked in place can fall in the face of personal tragedy and challenges. I don't have any family members who are gay, but I have hurt when I have heard of members of the gay community being turned away from their families and their churches. Your article was thoughtful, kind and fair to all parties. Thanks for such great reporting, and thanks for the courage of TFP to put your story on the front page. "Tempest in My Soul" was a journalistic masterpiece. It was written with sensitivity but pulled no punches. Thank you also for having the courage to write about a topic that is still taboo in many places, particularly where fundamentalist churches are in the majority. I just read your article. I was glued to it. What an amazing story, and what a well-crafted, well-written piece of work. I can't remember the last time I was that moved by a news article. I don't read the newspaper often, but I read your article ... the other day and I felt compelled (which is very rare) to email you and let you know how amazing and well written it was. Everything about it: the tone, storyline and your portrayal of the family, captivated me. Thank you for the article on the Nevels' struggle with their beliefs, and their love for their son. It was very well-written, and I felt that you conveyed the convictions of both sides in this issue, with compassion for the Nevels' story, and without condemning church leadership for the need to follow their own beliefs -- not an easy feat on this subject. As a lifelong Southern Baptist, I fear that we have forgotten the greatest commandments, to love our God and to love others -- not one word in there about judging and condemning! Your article points to what is a raging war within Christianity as a whole, particularly in North America. ... Thank you for your courage and integrity in writing Stephen's story. It should be a story read in every church, synagogue and mosque in our country. It is a story of no less power than those found in Jesus' own parables and stories. Thank you. Keep up the good work! Your writing will change the world. It has already changed my Tuesday. I'm just a little nobody, laying in my yellow sheets and drinking tea, way out in sunny San Diego, and you've altered my course. I have been struggling with my Christian beliefs and love of my best friend. He is a gay man, and I love him so very dearly. Your words have given me a renewed sense of peace with loving him. Christians are taught to love -- hate sin, but love people. In the article, when you said Stephen was holding both the hands of Jesus and his partner, the visual brought me to tears. Every once in a while someone writes a piece that captures the reality of a life situation in powerful way. And you just did. Thank you so much for your wonderful piece. It moved me to tears and captured so much about the particular theological and relational landscape of the South. I considered calling you about your article A Tempest in My Soul but thought I might cry if I did so I decided to write instead. I read a lot. I'm a reading fiend. I'm always looking for true quality journalism that rises above the facts, that achieves a level of eloquence ... art ... poetry if you will. This was one of the finest, most touching and beautifully written articles I've had the pleasure to read. Thoughtful and moving, wonderfully nuanced and detailed ... I hope I'm not the only person to tell you this. Thank you for being so thoughtful and caring in your work. It seems such a rare commodity in journalism these days. I have just read your story titled "AIDS in the pews" and found it incredibly enlightened and encouraging. This family has dealt with what so many other families either dealt with or chose not to deal with over the years. Whether it's AIDS or some other human frailty, families simply choose not to embrace those things that they do not understand. I am a Christian and believe homosexuality is a sin. I still appreciated your story about Matt and Frances. I have just finished reading your story about "AIDS In the Pews," and I couldn't wait to send you a note telling you how wonderful the story is. I kept wanting to race through it to see what happened but had to slow down and reread your lovely sentences. Such a wonderful narrative; it really spoke to me. I'm not gay, nor have I lost gay friends or relatives to AIDS, but I also can't understand how some Christians can feel as they do. I want to tell you that it's been a long time since I've been so deeply, almost painfully moved by a piece of journalistic writing. ... Not only is the story itself one worth repeating (and sharing, and sharing again, and sharing again -- as I plan to do), but your writing is graceful, thoughtful and evocative without being blatantly emotionally manipulative. I honestly sat at my kitchen table, reading it courtesy of a link, boingboing.net, and wept. Just wept buckets. The article was very complete and compassionate. I rarely write any comment or contact a journalist after reading a piece, but your story was amazing for so many reasons .... You presented the perspectives of the different "sides" without disrespecting either side, which few people have the ability or desire to do. Beyond that, you absolutely portrayed Mr. Nevels' love for his son and how it led him to believe that condemnation was not the right response. It was a beautifully written story. Thank you. Just wanted to let you know that I read the article "A Tempest in My soul: A son's secret brings a Southern Baptist minister to his knees," which was shared by a colleague here in New York, and thought it was a beautiful, well written and moving story. It's refreshing, also, to read a story that doesn't take too strong a political stand and includes a cast of many characters. In a political or religious setting, these issues sometimes seem to disregard the humans involved and focus on theory or theology, which only seems to perpetuate the conflict. Thank you for the beautiful piece "A Tempest in my soul." ...This kind of writing will bring healing to our land on this issue. A friend posted your story on the Nevels family to her facebook page and I just read it. ... As good as I've read in major metro papers.